Club Cat caters to a feline audience whose owners have the money to pay for luxury accommodations. The airline's CEO says its Hawaii test flights passed FAA inspection and a final OK will be announced soon. From its famous zoo to an old German village, Stephanie Kalina-Metzger has excellent suggestions for spending some time in historic Columbus. Better than joining the circus, here's an opportunity to get, literally, down-and-dirty with pachyderms. Clearwater Beach, Florida takes the top spot, and also ranks #6 in the world on TripAdvisor's Travelers' Choice awards. Samantha shares a tribute to a uniquely Western phenomenon—professional bullriders. An unusual bargain-finding service focuses on long-term and also supports striking teachers. DrFumblefinger visits the historic and popular La Biela café in the Buenos Aires neighborhood of Recoleta. It is thought to be the oldest café in the city. 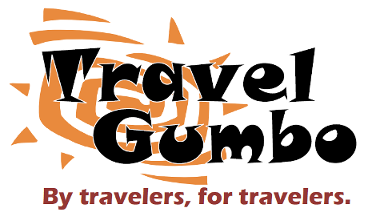 A new travel puzzle is posted for this week. Follow for daily clues and see if you can solve where Gumbo's visiting. Bolzano's daily market has a long tradition, a location at the center of town, and food that reflects its two heritages, Austrian and Italian. Atlanta's History Center has one of only two remaining 19th-century cycloramas, this one focused on the 1864 Battle of Atlanta. Copenhagen is set to join the elite list of non-French starting points for the iconic Tour de France bicycle race.